Note (11/30/13): This article has been updated — see here. 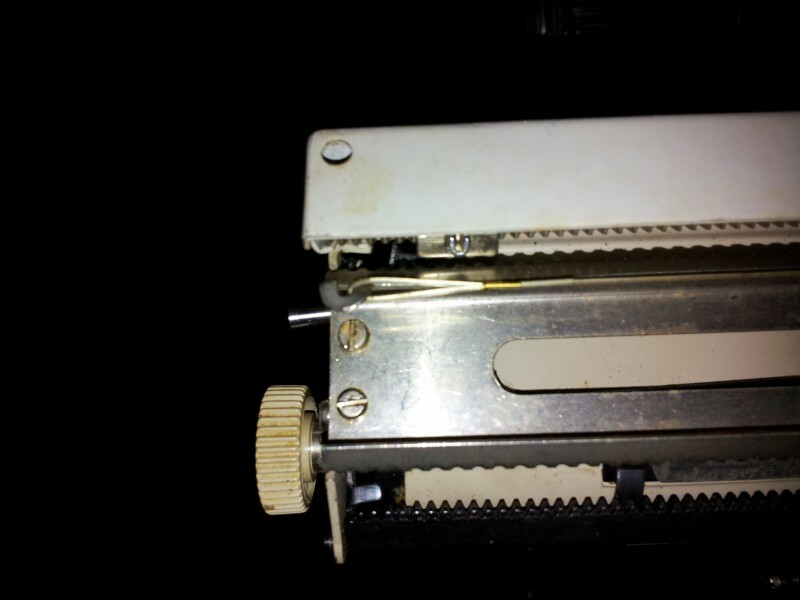 I recently purchased a typewriter (made by Packard, before they were joined by Hewlett), and took it out this morning in an attempt to figure out what to get from Staples to make it work again (I was told, hopefully accurately, that there are really only a few types of typewriter ribbons). I was struck by how beautiful it is, and how odd, set on the table next to a MacBook. There’s a story to be told about these machines that isn’t finished yet, and I wonder how touch screens will continue to catalyze whatever iteration of the keyboard comes next. I’m not certain that this machine was manufactured by Packard of Hewlett-Packard, but it’s quite possible. Does anyone recognize this machine? (I swear I’ve seen this model before, but I cannot recollect where.) According to the labels, the Packard was made in Italy. Regarding build quality, the Packard consists of plastic-body construction with an aluminum (?) internal structure. The plastic is cheap, and everything about this machine indicates it was an inexpensive typer, perhaps aimed at the student market. The two I’ve found are at Opencuney.org (mentioned above) and on eBay here.1 Mine has a serial number of 137643. I’d offer a typing sample, but the machine needs cleaning and a new ribbon. One last note, the eBay seller offered the Packard at a “buy it now” price of $10. I quickly made the purchase, never looking at shipping, which was $43 for expedited delivery. Neither had the seller, who graciously offered parcel post for $20, refunding the difference. That was much appreciated. 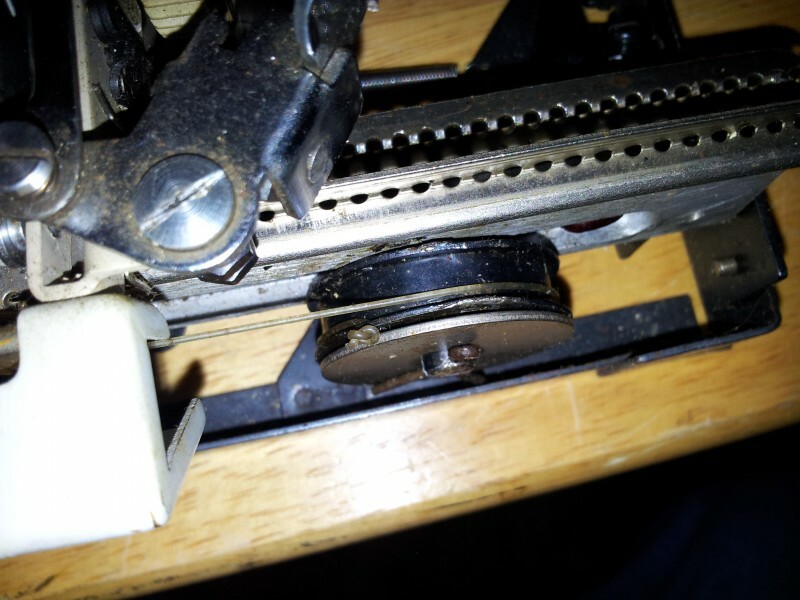 The carriage fully extended, the pull string wraps once around the mainspring wheel and attaches in a notch on the edge. Pull string hooks onto end of carriage. Boy, that’s an ugly little machine, I must say. But I’m a sucker for rarities too! Reminds me of Japanese portables, but I have no idea who made this one… Could it be a late development of the Montana clone of the Hermes Baby? Yes, it is definitely a Montana with Packard branding. The Montana was also sold as the Carlton and Vornado. An earlier version of the Montana, nearly identical to the Hermes Baby, was sold as the Viking. Thanks, Richard, I knew I had seen this machine before! I think my typewriter dates to the mid-1960s. I would be curious to know if it was indeed branded for Packard of Hewlett-Packard or for Packard Bell. I’m glad that my intuition was helpful! Slowly but surely, we piece together typewriter history. That makes a considerable amount of sense. I’ve been trying to imagine why Hewlett-Packard or Packard Bell would brand something as “Packard,” as opposed to their own brand identity. I will keep my eye out for an advertisement — I’ve searched Google in every way I know possible! Thanks for a great set of pages. 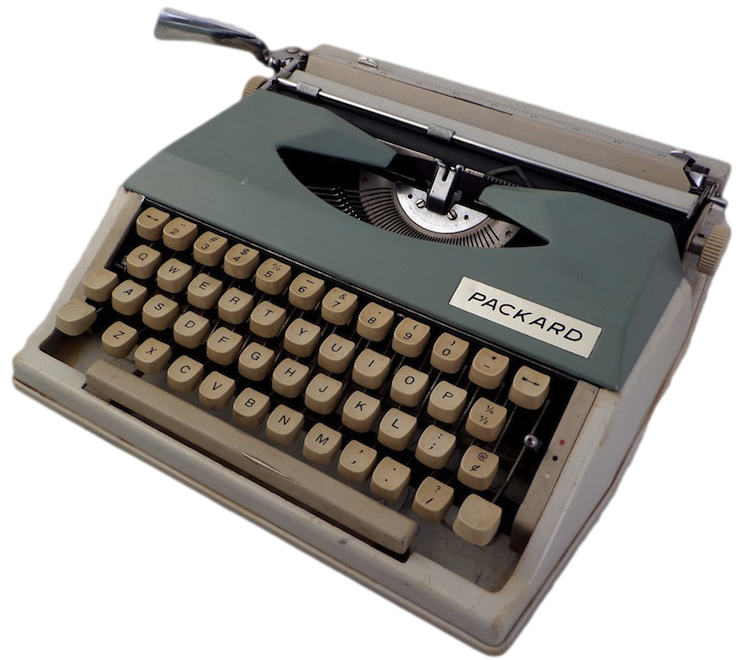 I have the exact same model typewriter..serial number 150573. My parents bought it in the mid 60’s (Montreal Canada) and I have had it ever since tucked away in the attic. I recently pulled it out to give to someone as a present. However the pull string in the rear of the machine has become undone and I cannot figure out how to fix it. Would you be so kind as to take a picture of the back of the machine and post it or send it to me. it would be much appreciated. See update in post. Pull string attaches simply enough, though I’m not sure how many times one should spin the wheel. I usually guess. I have a Electronic Packard Bell that I bought for my daughter over twenty-five years ago, it is till working but I can’t find a replacement ribbon for it. Please help.